I remember the day I saw it for the first time. I was hustling back from a day full of errands and obligations. The last one was a hospital visit with someone I cherish. It was the type of day where my car ride was filled with Hail Marys, as I drove along & lifted up prayers for all the many intentions I’d been asked to join in prayer with. I remember thinking to myself that life seemed particularly unkind that day. So much to pray for, so much sorrow and pain to ask for healing. And that’s when I turned the corner onto the road which leads to our home and spied it for the very first time..
which hung on a small lopsided pine tree, along the side of the road. Others began adding ornaments of their own to the tree! Alas, this single red ornament was no longer lonely! Seeing them made me realize that I was not the only one who enjoyed this ‘random decorating’ of a lonely small pine tree at the side of the road. Day by day the collection grew. It became a small slice of wonder to see how many more decorations would be added to the tree each day. And it became so infectious that I secretly hoped I would be able to join in with spreading the joy! However, with the recent move and the reality of still looking at a long list of things to do to prepare for the Holiday the opportunity to join in seemed improbable. The evening we pulled our own Christmas Decorations out for the first time in our new home I honestly felt over-whelmed! We had only been living here for a few short weeks and I’d managed to find ‘places’ for all (well, maybe most) of our STUFF. Now I was about to embark on Christmas decorating and it felt daunting. It was like being washed over and covered by a wet, woolen, blanket. None of it felt comfortable! For at least two days I could only open the lids on our boxes and stare. The tree stood assembled, lit and undecorated and I wondered to myself if I could pull off a very merry UNDECORATED year! Needing inspiration and motivation I dug through our tree ornament box until I found exactly what I was in need of at that moment…an ornament of our own to add to the roadside Charlie Brown tree! After choosing just the right one I prepared Helen, the best golden-retriever in the universe, to venture out with me for the short walk to the tree. I was so excited to be DOing something I’d been dreaming of for days that I’m quite certain I let a giggle or two escape, as I fastened the leash around Helen’s collar! I felt just like I did when I was a young child and couldn’t get to the Gregor’s sled-riding hill fast-enough to join in with all my other neighborhood friends, who were already whisking down the hill on their sleds having a great time! I was so excited I even allowed Helen to take on a quicker pace; which in hind-sight may not have been so wise carrying a glass ornament in hand! Once we arrived I had so much fun looking at all the other ornaments already displayed. It was wonderful to see them finally close up, instead of just gazing at them from my car as I’d drive by. As Helen and I walked around the circumference of the tree I couldn’t help but wonder how each person came to choose the one decoration they would add to the display. I’m certain each one came with its own unique story behind the giver. 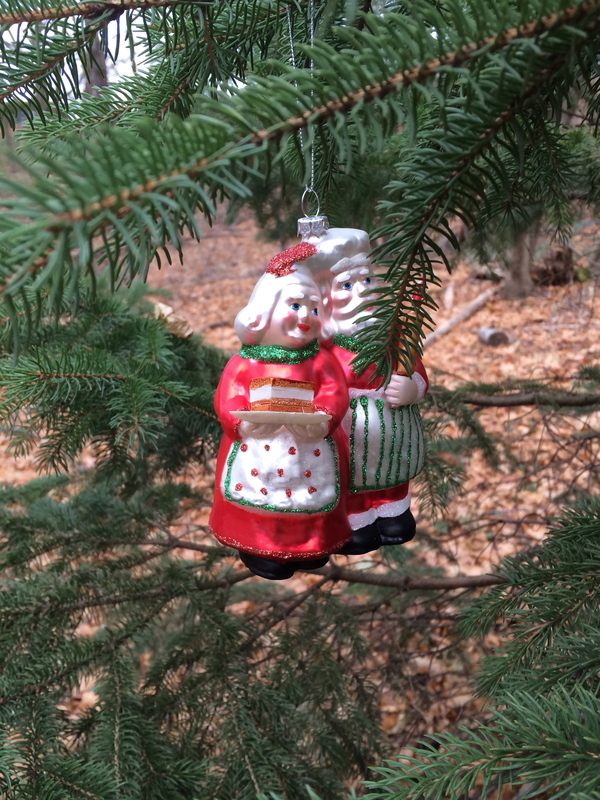 As Helen continued to sniff around the tree’s surroundings I located the branch I would display our ornament from and proudly hung it there: a rotund ‘Santa & Mrs’ busy baking Christmas treats together. This ornament always brought a reminder of the many aprons we’ve had around our home, from the time I was a young bride until now. The tradition of making them handed down to me from my grandmother, Doris. After snapping a picture of Helen in front of the tree I stood back to take it all in. How grateful I was for that one person’s random act of kindness of adding an ornament to this roadside tree, which now brought me daily slivers of joy! I felt a warm peacefulness I’d been missing with the chaos that had enveloped me since July, when the transition of moving first began. Mesmerized by the creativity of it all I almost jumped out of my skin when I heard a loud honking at the side of the road, which I’d had my back turned toward! An enthusiastic passenger yelled out from her now rolled down car window, “We want to add one too! 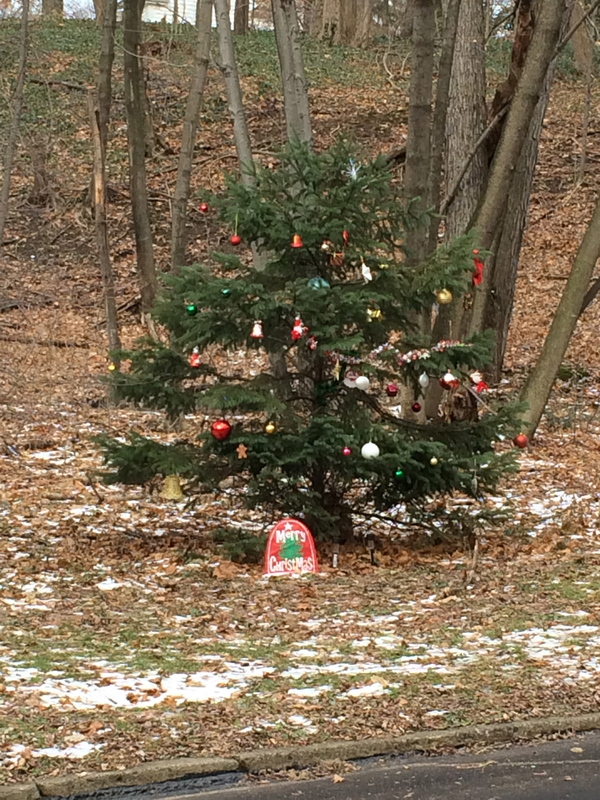 !” She proceeded then to tell me how they look forward to driving past to see how many new ornaments have been added and they plan to be a part of this roadside joy also! Another car just then drove up and pulled over also, this time with a small child spilling out onto the ground as the backseat door flung open! I knew, even before seeing it, exactly what was in his tiny little mitten hand that now planted itself in the light layer of mixed snow & leaves…another ornament to share with the tree. As he hung the ornament he was so excited to display, I collected Helen and giggled once again as we walked away; silently wondering to myself if this little guy felt the same way heading towards a sled-riding hill too. Walking back to the house, with a new pep in my step, I had a renewed spirit! Once home & wiping the snow from Helen’s paws, I returned to lid-less Christmas decoration boxes and began. The Spirit of Christmas was ignited in me now and the joy of decorating our new home was alive! 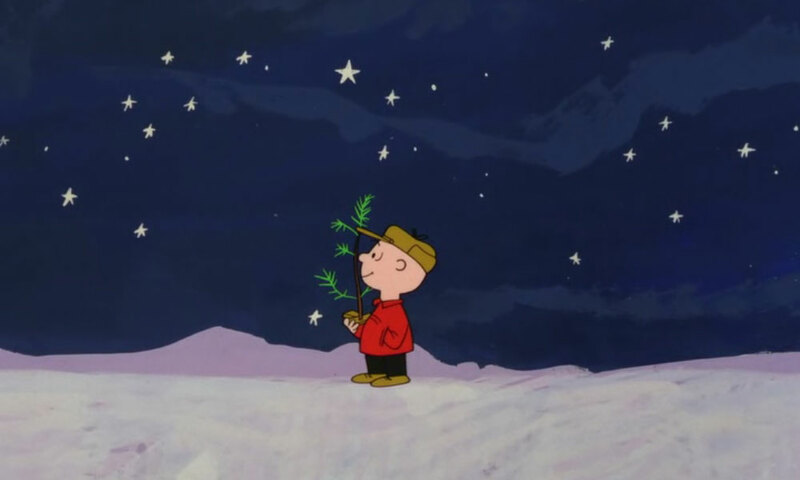 As the day unfolded and box after box emptied I reflected often on the Charlie Brown tree and how much I’d needed that unexpected roadside joy this holiday season. And I know that’s exactly what Christ hopes to give to us. Christ reaches out to us in many unexpected ways… hoping we will find HIS joy within it. Joy is often the smile we have inside us, no matter what is happening around us. 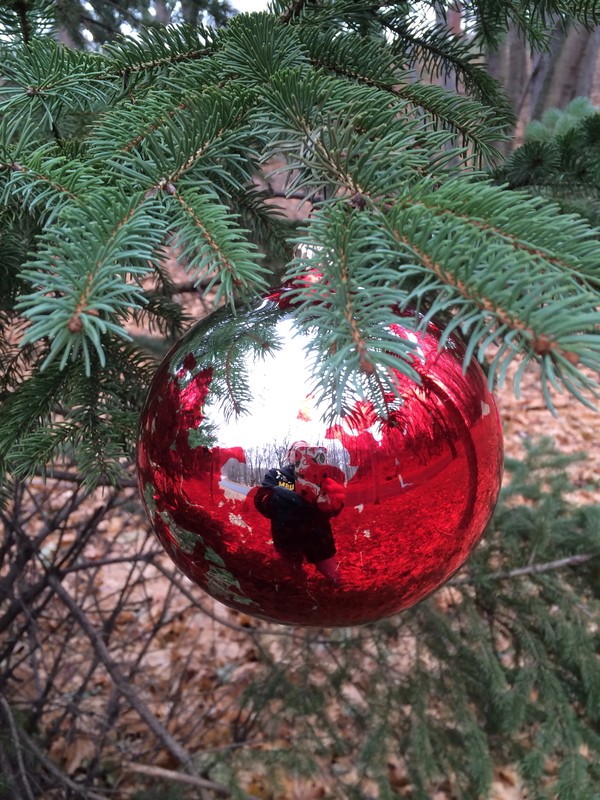 For me, God is our SOURCE of joy…even when it is found in a roadside Christmas tree that I discover Him. I am grateful for the reminder this season that even when the world around me seems particularly “unkind” God’s joy surrounds me and enfolds me in His care; reminding me (sometimes unexpectantly,) that peace still can be found. Since placing our own ornament on the Charlie Brown roadside tree I still continue to drive passed and watch the collection grow. However, now I’m not only looking at the ornaments that have been added; instead I’ve since included a small prayer of gratitutde for the person who stood there and placed that first lonely, red, enormously round, Christmas ball on a single branch. I pray they may know what a difference they made, even if only in a small way, in spreading the joy of Christmas & reminding me of His constant care. hugs n’ blessings for all the many unexpected giggles this holiday season…sled-rides & all! Next He knows your ringtone. What an inspiration for the true meaning of the season of Christmas!! Really enjoyed it! Thank You!! Hello my friend! 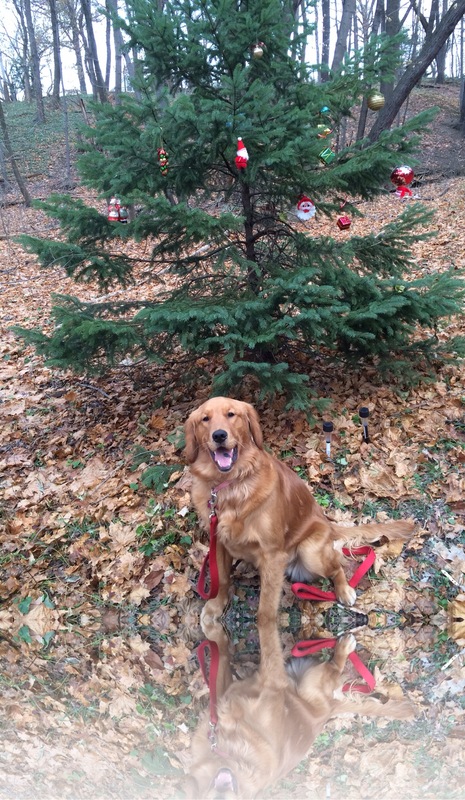 I too, noticed the tree with the one red ornament when we came to visit your new home! It brought a smile to my face and thoughts of the person that hung it there. I’m so happy that it brought you the spirit that you needed for the season.